A chef’s knife has a uniquely shaped blade making it easy to use for chopping or dicing by simply rocking the blade back and forth from the tip point. While great for chopping and dicing, the blade is also large and sharp enough to work well at cutting thick pieces of meat or vegetable, making it a terrific all-around kitchen knife. The santoku knife, with its thinner blade, is best-suited for precise cuts and slicing. Slicing vegetables, cheese, fish or meats can be accomplished easily by placing the tip of the blade on the cutting board at the far side of the food, and pulling the blade tip towards yourself to complete the slice through the item. Due to the thin blade of this knife, it should not be used when dealing with bones or pits. In the kitchen, the paring knife is the staple tool for those small, intricate cutting jobs. It will make quick work of tasks like peeling, coring, trimming or cutting. Most commonly it is used for peeling vegetables or fruits, hulling strawberries, deveining shrimp, and preparing garnishes. Ever need a sharp clean cut through a piece of cooked meat, poultry or fish? You needed a good carving knife. Carving knives have blades between 8 and 12 inches long and are designed to create attractive slices for serving. Carving knives with pointed tips are primarily used for bone-in meats, whereas those with rounded tips are used for boneless meats and fish. 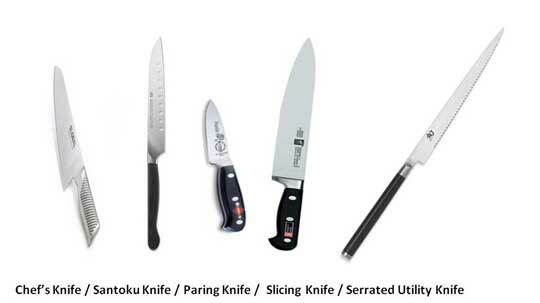 Utility knives usually have 5-8” blades, longer than a paring knife, but shorter than a chef’s knife. It’s serrated edge makes it easy to use for slicing fruits, vegetables, and bread. Chopping chocolate, peeling pineapples and cutting hard cheese are other tasks for which this knife works well.